Note: This is a sub-section of British and Colonial Aeroplane Co. 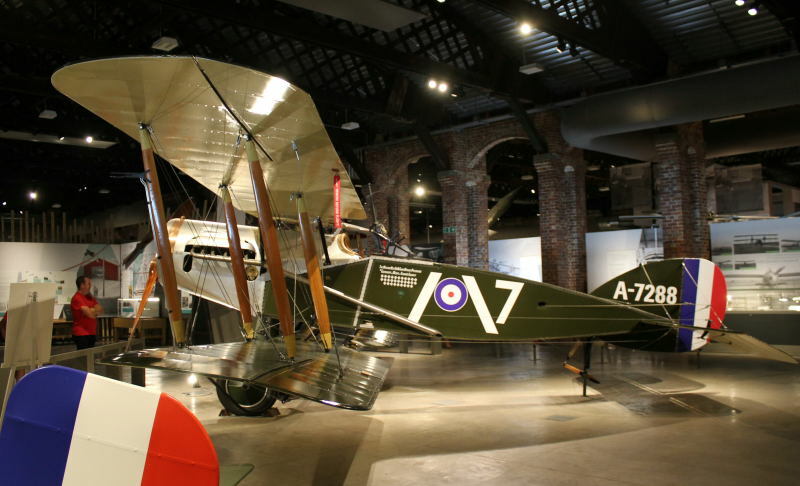 The Bristol F.2 Fighter was a British two-seat biplane fighter and reconnaissance aircraft of the First World War flown by the Royal Flying Corps. Between 1916-1927 there were 5,329 built. The Bristol F.2 Fighter is often simply called the Bristol Fighter or popularly the "Brisfit" or "Biff". Despite being a two-seater, the F.2B proved to be an agile aircraft that was able to hold its own against opposing single-seat fighters. Having overcome a disastrous start to its career, the F.2B's solid design ensured that it remained in military service into the 1930s and surplus aircraft were popular in civil aviation. Type: Two-seat biplane fighter and reconnaissance aircraft. The Bristol fighter's basic design stemmed from design studies by Frank Barnwell in March 1916 for an aircraft in the same class as the R.E.8 and the F.K.8 - the Type 9 R.2A with the 160 hp Beardmore engine and the R.2B, powered by the 150 hp Hispano Suiza. Neither type was built as the new 190 hp (142 kW) Rolls-Royce Falcon I inline engine became available, and Barwell designed a new aircraft around the Rolls-Royce engine. The Type 12 F.2A was a more compact design, intended from the outset as a two-seat fighter: it first flew on 9 September 1916. The F.2A was armed in what had by then become the standard manner for a British two-seater: one synchronised fixed, forward-firing .303 in (7.7 mm) Vickers machine gun, and one flexible .303 in (7.7 mm) Lewis Gun mounted on a Scarff ring in the observer's rear cockpit. Only 52 F.2As were produced before production switched to what became the definitive Bristol Fighter, the Bristol Type 14 F.2B which had first flown on 25 October 1916. The first 150 or so were powered by the Falcon I or Falcon II engine but the remainder were equipped with the 275 hp (205 kW) Falcon III engine and could reach a maximum speed of 123 mph (198 km/h). The F.2B was over 10 mph (16 km/h) faster than the F.2A and was three minutes faster at reaching 10,000 ft (3,000 m). A second Lewis gun was often added to the rear cockpit. Rolls Royce aero engines of all types were in chronic short supply in this period, and the Falcon was no exception. Plans to make the Bristol Fighter the standard British two-seater, replacing the R.E.8 and F.K.8, stalled against this barrier; there simply would not have been enough Falcons available. Efforts to find an available powerplant that was sufficiently powerful and reliable, ultimately failed. The Type 15 was fitted with a 200 hp (150 kW) Sunbeam Arab piston engine. This motor suffered from chronic vibration and the "Arab Bristol" was never a viable combination, in spite of prolonged development. A few Arab-engined Bristols were at the front very late in the war – but most British reconnaissance squadrons had to soldier on with the R.E.8 and F.K.8 until the end of hostilities. The Type 16 was fitted with a 200 hp (150 kW) Hispano-Suiza piston engine. This worked better than the Arab - but the Hispano-Suiza availability was no better than for the Falcon, and the motors that were available were required for the S.E.5a and Sopwith Dolphin. The 300 hp (220 kW) version of the Hispano-Suiza, suggested for the Type 17 was not available in numbers before the end of the war. Other engines tried or suggested for the F.2B were the 200 hp (150 kW) RAF 4d, the 180 hp (130 kW) Wolseley Viper and the 230 hp (170 kW) Siddeley Puma. The Type 22 F.2C was a proposed version adapted for a radial or rotary engine; either a 200 hp (150 kW) Salmson radial, a 300 hp (220 kW) ABC Dragonfly radial (Type 22A), or a 230 hp (170 kW) Bentley B.R.2 rotary (Type 22B). The United States Army Engineering Division had plans to develop and build an American version of the Bristol Fighter. But efforts to start production in the United States foundered against the mistaken decision to power the type with the 400 hp (300 kW) Liberty L-12 engine – a totally unsuitable engine for the Bristol, as it was far too heavy and bulky, the resulting aircraft being nose heavy, with only 27 of the planned 2,000 being built. Efforts to change the powerplant of American Bristol Fighters to the more suitable Liberty 8 or the 300 hp (220 kW) Hispano-Suiza came up against political as well as technical problems, with one each of the Hispano-engined Engineering Division USB-1A and the Liberty L-8-engined Engineering Division USB-1B built. Limited numbers of aircraft designated XB-1 and later XB-1A (with Hispano or Wright engines) were built postwar. Postwar developments of the F.2B included the Type 14 F.2B Mk II, a two-seat army co-operation biplane, fitted with desert equipment and a tropical cooling system, which first flew in December 1919. 435 were built. The Type 96 Fighter Mk III and Type 96A Fighter Mk VI were structurally strengthened aircraft, of which 50 were built in 1926-1927. Surplus F.2Bs were modified for civilian use. The Bristol Tourer was an F.2B fitted with a Siddeley Puma engine in place of the Falcon and with the cockpits enclosed by canopies. The Tourer had a maximum speed of 128 mph (206 km/h). When initially deployed, aircrews were instructed to maintain formation and use the crossfire of the observers' guns to meet any threat from enemy fighters. This was standard procedure at the time, and worked well for such types as the F.E.2b. For the Bristol, these tactics were flawed and did not withstand the first contact with the enemy. The F.2A arrived on the Western Front in April 1917 as the British launched the Battle of Arras. The very first F.2A patrol of six aircraft from No. 48 Squadron RFC, led by Victoria Cross recipient William Leefe Robinson, ran into five Albatros D.IIIs from Jasta 11 led by Manfred von Richthofen. Four out of the six F.2As were shot down - including Robinson, who was captured - and a fifth was badly damaged. More flexible, aggressive tactics soon proved that the new Bristol was by no means as ineffective in air-to-air combat as its first encounter with the enemy seemed to indicate. In fact it was eventually realised that the type was fast and manoeuvrable enough to be flown in combat more or less like a single-seat fighter; the pilot's fixed forward-firing gun serving as the principal weapon, with the observer's flexible gun serving mainly as a bonus "sting in the tail". Flown in this manner the Bristol Fighter was a formidable opponent for any German single-seater. In September and October 1917, orders for 1,600 F.2Bs were placed and by the end of the First World War, the Royal Air Force had 1,583 F.2Bs in operation. A total of 5,329 aircraft were eventually built, mostly by Bristol but also by the likes of Standard Motors, Armstrong Whitworth and even the Cunard Steamship Company. After the war, F.2Bs continued to operate in army cooperation and light bombing roles throughout the British Empire, in particular the Middle East, India and China. The F.2B also served with the New Zealand Permanent Air Force and RAAF as well as with the air forces of Belgium, Canada, Ireland, Greece, Mexico, Norway, Peru, Spain and Sweden. It was not until 1932 that the F.2B was finally withdrawn from RAF service; its last unit being No. 20 Squadron RAF stationed in India. The type lasted a further three years in New Zealand. In 1920, Poland bought 107 Bristol Fighters, thus becoming second largest user of this type (105 with Hispano-Suiza 300 hp/220 kW engines, two with RR Falcon III). Forty were used during the Polish-Soviet war, among others in battle of Warsaw, as reconnaissance and ground attack aircraft, the rest became operational after hostilities. Two were shot down, one was captured by the Soviets, several were lost in crashes. They served in Poland for reconnaissance and training until 1932. This page was last edited on 9 November 2018, at 15:04.